Jaipur is a magical city bursting with life, history and awe-inspiring architecture. Getting around in Jaipur was an urban safari. Monkeys, cows, dogs, birds, peacocks, and camels run the show. After adventuring in Jaipur, I can share with you what I got up to and what I consider to be the 20 best things to do in Jaipur. While you won’t be able to fit all of these awesome spots into 24 hours, pick a few of the top places to visit in Jaipur in one day. I have also put together what I consider to be the best one-day itinerary for Jaipur. So you can follow that one-day Jaipur itinerary or you can make your own from all of the suggestions in this blog post about all of the best places to visit in Jaipur. Treebo Aroma Residency (Budget) I stayed in Treebo Aroma Residency which is a 3-star hotel for just $16 USD per night. It was a cheap base for my adventures. Air conditioning was great, Wifi was good enough to blog and all of that good stuff. The location was central enough for us to tuk-tuk to most places without too much hassle. This is a great option for an adventure base at a budget price. Royal Heritage Haveli (High End) The Royal Heritage Haveli, is a 4-star hotel, which has opened its doors as a hotel after more than 150 years as a boutique accommodation. This is an experience in itself. The interior of this hotel is unbelievable and will give you a palace to retreat to after visiting the other historic palaces and forts in Jaipur during the day. The stunning hotel has all of the trimmings including a fitness center, swimming pool, restaurant and immaculate grounds to go with the breathtaking interior. Fairmont Jaipur (5-star) If you are going to stay 5-star, there are few better places to do it than in Jaipur. For just over $100 USD you can stay in the hotel of your dreams making your stay in India a magical time to remember. The Fairmont is more of a castle than a hotel. Classic India meets Las Vegas as this modern kingdom will be the highlight of your time in Jaipur. Even if you prefer a budget option, click the link to check out this amazing hotel… it’s mindblowing. The Jaipur City Heritage Tour is by far the most reliable and best experience for a tour in Jaipur. With hundreds of reviews you can read, you can be sure you will get a local guide who speaks English and knows Jaipur like the back of his hand. These are the places included in your tour of Jaipur. This fort is easily the most impressive of all architectural structures we visited while in Jaipur. A huge lake is located at the foot of the fort before a winding path leads visitors up towards the main courtyard. Goats and dogs run wild throughout the fort while thousands of pigeons flock to the perimeters where they are fed daily by locals. Amber Fort or Amer Fort as it was referred to by our tuk-tuk drivers have some impressive rooms and details. Arches and fine hand-made drawings and designs are spread throughout the fort. If you are on a budget, seeing the fort alone will be more than enough and it is free! Although if you have a little extra cash to splash the Amber Palace will set you back 500rp ($8). This is definitely one of the best places to visit in Jaipur in one day and if you only have one day I highly suggest getting to Amber Fort. It should be your number one spot on the bucketlist. You might prefer to have a guide to show your through the fort and to explain the history, traditions, and significance of everything inside the walls of the Amber Fort. There is a very affordable guided tour of the Amber Fort, which offers English Speaking guides who are experts on the history. Nahar means tiger. Garh means fort. In English, this spectacular fortress translates to the Tiger Fort. Up in the hills of Jaipur, the Nahargarh Fort walls wind along the ridges of the mountains. Standing on the fort walls you will overlook neighborhoods brimming with intense action. If you arrive before sunset you can wander through the gallery or the wax museum. I arrived just before sunset and both were closed. The driver took us straight through to the restaurant. We paid 200rp ($3), which included entry and a free chai tea and a bottle of water. We headed down along the perimeter of the fort, scaling the wall for a good vantage point. As the sun set, we found ourselves overlooking a neighborhood, which bordered a huge sand dune. The homes on the edge of the sand dunes were almost submerged in sand. Hundreds of children played cricket and games on the dunes as we watched the last light of the day fade beneath the horizon. There is an awesome tour that takes you to both the Nahargarh Fort and the Jaigarh Fort on a half-day tour. I highly recommend visiting both! Hopefully, this will help you decide whether the $8 is worth it to enter the Amber Palace or just to enjoy the Amber Fort. Inside the Palace is an immaculate garden boasting perfect symmetry, a mirror room, several stunning courtyards, a museum and underground tunnels. Some of the colorful designs within the palace are breathtaking. I have to admit I waited almost 15 minutes for people to clear in front of a beautiful arch for a photo but finally gave up. You won’t be alone here. Definitely worth a little explore but if you are on a budget this is more than a night’s accommodation for approximately a one-hour visit. It was a little expensive but definitely one of the most spectacular places to visit in Jaipur. This isn’t your average safari and I’m sorry if you are about to be disappointed. I am talking about an urban safari. Take a tuk-tuk anywhere in the city to your destination and the safari begins. On the streets of Jaipur, you can expect to spot camels in the traffic, pigs eating the scraps, monkeys running riot, enormous cows causing traffic jams, well-fed dogs, masses of pigeons, mongoose, squirrels and an abundance of peacocks. I’ve heard the term urban jungle thrown around before but Jaipur is for real, an urban jungle. I also put together this 4-minute video highlighting the best places to visit in Jaipur in one day. One of my favorite nights in Jaipur was completely unplanned. We headed to the Hawa Mahal area and before we could make it to the rooftop cafe we were headed to, a man yelled out at us. He was indeed trying to befriend us so we would ultimately buy some textiles from his store. Don’t be offended he is just working his corner. His name was Harish, he’s traveled all over the world and his secret sunset spot was incredibly cool. He hung out with us, offered us weed and became our best friend for the forty minutes it took the sun to set. He even took over my camera and shot a few photos for us. Find a random rooftop and try and get on top of it for sunset. Beware monkeys! The big drawcard of the Jaigarh Fort is that it is home to the world’s biggest cannon. Although we were later told German had a bigger cannon on a carriage, this is the largest free standing cannon in the world. We entered for 100rp ($1.50) and reluctantly allowed a guide to latch onto us. Although in the end he was a champ and taught us so much about the fort and the royal family who lived here along with 10,000 soldiers. The fort is above Amber Fort and has some stunning panoramic views as well as a mental troupe of monkeys which tried their mighty best to poop on us. Back to the cannon. When fired its range was 40 kilometers and when the cannon ball landed it would make a 5-kilometer crater of damage. The cannon was only ever fired once as a test run and it made a lake. It was never needed after that because of the good relations to the king managed to keep, avoiding any major conflicts. If you are into history put this on your list as a place to visit in Jaipur. Get a guide and you will enjoy learning from a knowledgeable local. We visited the Jaigarh Fort before heading to Nahargarh Fort for sunset if that helps to plan your day out. The first time we visited the Nahargarh Fort we arrived at 6 am but found we were locked out. We still enjoyed possibly the most epic view of the entire week while hanging around on the outside walls. The moon was still visible before the sunrise and there was no-one around. I didn’t expect India to feel exactly as it did during the moments these photos were taken. A vast, barren, peaceful, desert city. Although there were times it was anything but peaceful, like peak hour in a tuk-tuk. A tuk-tuk is going to be your best mode of transport unless you are the motorbike kind of traveler. Because there were two of us the price of the tuk-tuk worked out fairly cheap. A 20-minute ride can cost you a couple of bucks depending on your negotiating skills. We had a range of drivers, some more aggressive than others. While we had no crashes we did ram a few people, but bumper cars is the norm in Jaipur so no worries. Aside from the incessant beeping, it was a fun experience competing in the city rally every time we were headed to a new destination. Coming from a country with road rules, beeping at the person in front of you who has nowhere to move may seem unnecessary, loud like it might be a sound you hear in your sleep. However, enjoy it. This is how it is. Laugh don’t get frustrated and be nice to your driver he most probably knows the spots you won’t find in this blog post or any for that matter. We thought we had run out places to visit for sunset. Tuk-tuk driver to the rescue. After stopping a few times to ask his mates he told us he had a spot we hadn’t been to yet. Ganesh Temple was lodged at the top of a mountain. A grueling, but short, set of stairs had us breathing hard by the time we made it to the top. We enjoyed views of the city on one side and watched the sun fade behind the mountain on the other. Aptly named, this is one of the best spots for sunset. The walk up from the entrance archway is owned by monkeys. They are absolutely everywhere and we even managed to find their godfather the monkey man who has apparently been featured in several articles and documentaries. He fed the monkeys by hand and they seemed to trust him. Along the steep pathway to the sun temple, families were living in tents, offering chapati to support themselves. We then bumped into one of the most epic characters of the trip. He was a yogi, claiming to have the trident naturally printed into his tongue and hand. After each photo we took he chanted. He asked for money and more or less explained that he makes a living by looking like a genuine boss sitting on top of the hill. The temple at the top is home to a family who tends to the building. They explained a little about the temple and less than subtly asked for a donation. The sunset was worth the small note I tipped into the box. From the viewing platform beneath the temple, we watched monkeys and goats running rings around the cows below. The sun slowly cast a shadow on the hundreds of cricket games being played in the streets below. Easily one of the best places to visit in in Jaipur for checking out the sunset. I’m Australian and have played plenty of backyard cricket. I thought I could swing a bat. I can’t. When I faced a few older guys in a small courtyard I faced an over of balls. I hit none. I was clean bowled on the last ball. Cricket is played all over Jaipur and luckily I was able to redeem myself in almost two hours of street cricket with a bunch of young kids and teenagers. We played with a real cricket bat but a plastic ball, which I happily smacked all over the neighborhood. They wanted me to keep batting when I got out to see who could be the next to hit the broken chair, that sat limply behind my awkward batting stance. Playing games whether it be cricket, football or volleyball is a great way to gain some trust and make a friend. One of the fathers invited us in for chai and a snack. He was also a 7ft tall Indian, a gentle giant who managed to break every crappy stereotype people have about India with one cup of tea. I’m not a tea guy, I’m hardly a coffee guy. You guys know me by now, I’m a mango smoothie guy. But in India, you become a chai guy. For 10rp or 15 cents you can get a small cup of freshly brewed chai tea with milk. It’s always good to take a break from the hot sun or whatever excuse you need to make up. It became the glue that held our adventures together. Between morning and lunch, lunch and afternoon, we enjoyed a little chai. 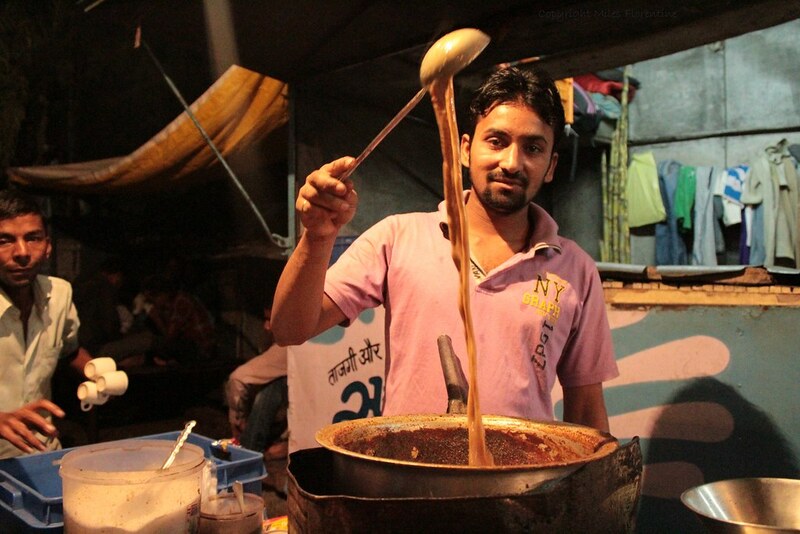 The best part about the chai tea is watching it get poured from almost a meter above the pot. A truly skillful art and one of the most theatrical hot drink preparation performances you will witness. Any of them. It doesn’t matter just immerse yourself in the thick of it. Take in the smells, the rush, the noise, feel your adrenaline peaking. The markets are all over Jaipur and it’s not hard to stumble into an authentic marketplace, where locals are wheeling and dealing with each other. Try a chai, some local foods even if you have no idea what you are eating. One night we ate something resembling a deep fried Indian burger. It tasted great and the spice set my tongue on fire. 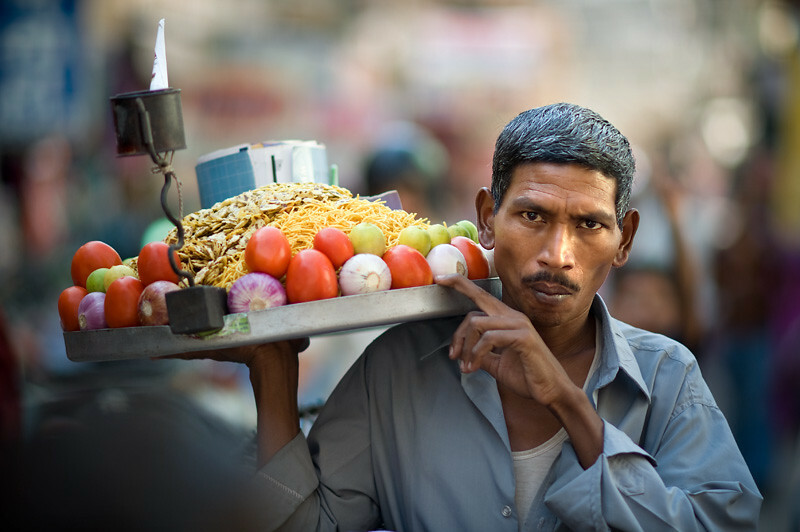 There are tons of awesome markets to head to near Hawa Mahal in the pink city. Although it isn’t necessarily the best viewing spot for the sunrise unless you scale the mountain, which is not normal by the way, it was our favorite spot of the trip. At the entrance, I felt like I was in a movie. Hundreds of monkeys streaming out of the temple, huge herds of cows everywhere. We spent over 20 minutes marveling at the scene before we even got to the entrance. We were charged per camera, which was a new system. 50rp for camera and 200rp for a video camera. Luckily the Sony a7ii looks like just your average camera so I got away with only paying 50rp. Inside huge temples line the road, leading towards the holy baths. If you do go for sunrise, plenty of locals will be taking their daily bath, which they believe has many benefits for the body and mind. Unusually people seemed to let their walls down in and around the bath. Women bathed fully clothed, men bathed in underwear and kids made big splashes jumping into the water. I joined a wolf pack of kids and was immediately inaugurated as their new leader. With my new crew of 15 boys, I climbed to the top of a small rocky outcrop. It gave me a great view of the holy baths, all the way down to the temples and back to the entrance. Jackie and I both agreed this was our favorite place to visit in Jaipur in one day and would be a great start if you can get up for sunrise. I love shooting portraits but even if you are just an observer you are in a land of some unique characters. Taking photos often requires lots of interactions and I get to shake a lot of hands and have some interesting chats. As always you need to be respectful and try and feel the situation. If you are in someone’s personal space and they are clearly irritated by the camera, apologize and put it away. Most people will be more than happy and give you a nod to take a photo. I’m no foodie and I can’t handle spice. You would think eating in India would be a struggle for me. However, as always I enjoyed the food and found several favorites that I went back to many times. A samosa set me back 10rp, while Daal and Naan might cost you 60rp-150rp or $1-2. Lassies, a yogurt based drink are served out of terracotta cups, a great refresher. Lime soda is the drink of the town and to be honest wasn’t my favorite but when it’s steaming hot, why not. I think the key is to just be open to trying as many new things as possible. If you are worried about getting sick, that is valid. However, you would be missing a huge part of the experience if you just ate at your hotel. You would also be spending more than five times more than eating on the street. Stay safe but stay hungry. Hawa Mahal or the Palace of the Winds is the Palace of Jaipur. Originally built in 1799 for women to observe the streets without being seen, the palace is now one of the most iconic buildings in Jaipur. 935 small windows decorate the exterior of the building, which has five floors in total. When I first saw the Hawa Mahal I was taken aback by its majestic design. However, it wasn’t until I came back to observe its transformation as the sun went down and the lights came on. It was then that the pink color of the palace and the different shades of the windows truly caught my eye. The Hawa Mahal is one of the most iconic places to visit in Jaipur in one day. Jal Mahal means Water Palace and this palace is much more than just a structure on the Man Sagar Lake. Near to the Nahargarh Fort and Amber Fort the Jal Mahal has one of the most unique architectural designs in Jaipur. Of the five floors to the Palace, four of them are underwater. I wish we could have had a chance to see that, an underwater palace. However, boats no longer take people out to the palace as it is being renovated among other issues. The City Palace also includes Chandra Mahal and Mubarak Mahal along with other buildings in the complex. The complex was built in the early 1700’s is the attraction all the locals will tell you to visit. The City Palace is one of the most popular places to visit in Jaipur in one day. However, I never made it inside. Why? The cost was about $10. We caught glimpses and checked a few photos online and it seemed very similar to some of the forts and palaces we had paid $1-2 or even visited for free. The architecture did look quite spectacular, however, that was something quite common in Jaipur. If you are more of a history buff than I, maybe the $10 fee is a worthy spend but I decided to skip this one. I added it here as it is a popular attraction and it may appeal to you. Hey Jackson, you seem to have explored practically every great thing that Jaipur has to offer. Right from cricket to the palaces in the city. If you do visit the next time, do try the Daal Baati that they serve in Rajasthan, it’s a local dish. Jaipur is an incredible city with such sublime and rich culture and tradition preserved so well. I would recommend everyone to visit the city and relish its stunning historical forts, palaces and temples. You will be amazed with the in-hand experience of Rajput history seeing their relics. And for more information, I think this blog post is great. The best place to enjoy the sunrise in Jaipur is from Nahargarh Fort. Really enjoyed your post. We are on a tour but have a spare morning in Jaipur.